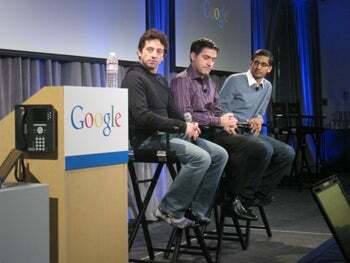 From left to right: Sergey Brin Google co-founder, Matt Papakipos, Google engineering director, and Sundar Pichai, Google VP of product development. Google opened its doors to the press Thursday to show off its hotly anticipated Chrome operating system for the first time. In a small auditorium in Mountain View, California, Google VP of Product Development Sundar Pichai took to the stage to give us a demonstration of what Chrome OS actually is. Some rumors were confirmed, others dispelled, as the operating system emerged into the light of day. Here's what we now know about Google's Chrome OS. "As of today, the code will be fully open," Pichai said. In fact, shortly before the press event began, the unofficial Google OS blog announced public availability of the Chrome OS source code. With this code now in the hands of the open source community, it shouldn't be long before various builds of the code end up trickling onto the Web. To explain why Google decided to take on the OS project in the first place, Pichai put the project into context of the existing Chrome Web browser, which now has more than 40 million users worldwide. The browser is currently available only for Windows, though Mac and Linux versions will be available before the end of the year. "The Mac version is nearly ready," said Pichai, who is using it as his primary browser on his own machine. In addition to new versions for Mac OS X and Linux, Google is nearing the release of browser extensions like those found on Firefox and Internet Explorer. One differentiating point is that Chrome extensions will be automatically updated by the browser, simplifying the process of keeping your favorite extensions working when the browser is updated, which is an issue that currently frustrates many users of mainstream browsers. HTML5 is a core driver behind Google's Chrome OS strategy. "We're all used to running rich games on our personal computer. We wanted to be able to run the same rich games in the browser," Pichai said. An important facet of HTML5 is that it allows Web apps to address the PC's processor and other hardware resources to run 3-D graphics, video, and audio locally on the PC, and address local storage. Perhaps surprisingly, Google has also been working with other browser vendors to increase support for HTML5. According to Pichai, one of the principal motivations behind creating a Chome operating system is speed. Pichai repeatedly alluded to Google's desire to make the computing experience more like a TV viewing experience in both simplicity and speed. "From the time you press boot, you want it to be like a TV," he said. "Chrome on Chrome OS will be even faster than Chrome." The meaning here is clear: Google wants to build an instant-on device that lets users get on the Web as quickly as they could turn on a TV. But it also means the company is pushing to make a more streamlined OS that requires less hardware and includes fewer background processes that eat into system resources. Chrome OS is currently targerted at netbooks and the emerging class of mobile tablets. The convergence of mobile computing devices--laptops to netbooks, and phones to tablets--represents something of a sweet spot for Google, in which a low-profile cloud-based OS could give users a cross between the simplicity and speed of a phone and the more robust experience of a laptop. For his demo of the Chrome OS, Pichai used an "off-the-shelf Eee PC netbook," which actually ran the presentation via Google Docs Spreadsheets as part of the demonstration.